"It's where you're suppose to be"
Serves: Hunt, Ingram, Mountain Home, and "The Divide"
"Historic Hunt — A Driving Tour", a detailed brochure available free at the Chamber and many retail locations, identifies 41 highlighted points, with photographs and a brief history of each point. Hunt General Store: 830-238-4410; http://thehuntstore.com. Country store, cafe, gas, bank, live music, real estate, B&B. Est 1946. Open 7 days/wk. An iconic community gathering place & hub. HISTORY and profiles: Handbook of Texas Online: "Hunt is at the junction of the north and south forks of the Guadalupe River, twelve miles west of Kerrville in central Kerr County. The area was settled in the late 1850s by people moving west from Kerrville up the Guadalupe River valley in search of available farm and ranch land. The vicinity's first post office, called Japonica, was opened three miles north in 1880 and provided service until 1918. C. Y. Davis served as its first postmaster. In 1913 another post office, called Hunt, was opened at the forks of the river and named for R. F. Hunt, who owned the land on which the post office and accompanying store were built. 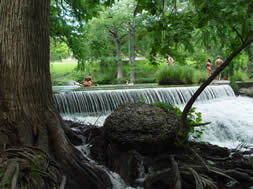 Since the 1920s Hunt has served as the center of one of the most popular Hill Country resort areas. The majority of Kerr County's guest ranches and summer camps are located within a few miles of the town; its economy depends on these visitors and on the part-time residents who own the many vacation homes lining the river. In 1974 the population of Hunt was estimated at 700. In 1990 it was 708. The population remained the same in 2000." Book: Hunt, Texas . . the early years . . 1857-1959, by Jeanne Sutton. 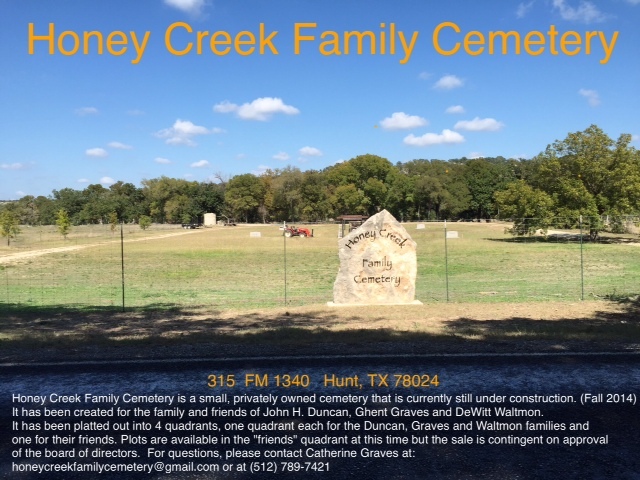 Includes snapshots of events in and around Hunt that gives this small Texas town its rich heritage vested in the schools, mail service, churches, stores, camps, lodges, cafes, organizations, wars, floods and more, all of which have forged Hunt into the community that it is today. 150+ pages of fully referenced text and 59 period photos. The Hunt Preservation Society: "Historic Hunt — A Driving Tour" brochure. See more details in Directory below. Heading west from downtown Hunt, the Guadalupe River forks to the west (called "North Fork", along FM-1340) and to the southwest (called "South Fork", along TX-39). 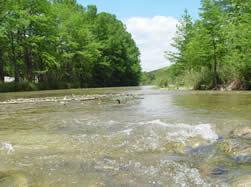 The Ingram dam is the approximate dividing point between Ingram and Hunt on TX-39. PRESBYTERIAN MO-RANCH ASSEMBLY (& CONFERENCE CENTER): 800-460-4401; 830-238-4455; 2229 FM-1340, Hunt, TX 78024. North Fork. www.moranch.com. Open to the public. (THE) HUNT PRESERVATION SOCIETY: 830-238-3787; POB 632, Hunt, TX 78024. Non-profit with mission to preserve the area’s inherent beauty, perpetuate a respect for the community's history, and inspire conservation of the ecological environment. CRIDER'S RODEO, DANCE HALL & CAFE: 830-238-4441; TX-39 (3.5 mi W of town), Hunt, TX 78024. http://cridersrodeoanddance.com. CAMP HEART O' THE HILLS: See Heart of Hills below. CAMP LONEHOLLOW: 830-966-6600; Hunt (1010 Cooley Ln, Vanderpool, TX 78885, TX 78024. www.lonehollow.com. For boys and girls.